Maximum school sizes and how the district will grow have become two of the most important issues for the 16 candidates running for School Board. Maximum school sizes and how the district will grow have become two of the most important issues for the 16 candidates running for the Williamson County School Board. In a candidate forum hosted by Home Page Media Group and Williamson, Inc. Thursday night, each district’s candidates had the opportunity to share where they stood on various issues. Coming up this summer, school board members will look at the policy that handles school sizes. Plans for the Franklin High and Brentwood Middle and High campuses will also come under review, but will ultimately revolve around what is decided about the capacity for schools. District Seven had the most contentious debate over the issue of both feeder patterns and rezoning. Candidate Christopher Richards said he liked the idea of larger schools if it meant curtailing the amount of times families had to endure rezoning. Overall, he said would be in favor of larger schools if it meant keeping the Brentwood community together. Incumbent Bobby Hullett said he didn’t believe a standard school size would fit for every district. Coming from the perspective of going to different elementary schools until the fourth grade, he said he understood how it felt be moved around, like some kids might face with another Williamson rezoning. Though, he said if parents wanted to have their children in the same schools from kindergarten until their senior year, they would need to enroll them in private school. “I like the policy we have in place because it creates a sense of community,” he said. “Kids learn social graces with split feeder pattens. 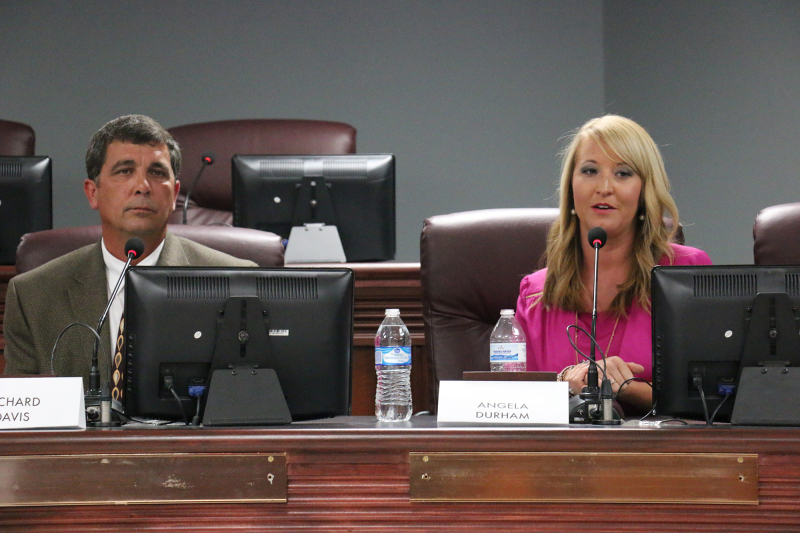 The third District Seven competitor, Jennifer Luteran, said she completely disagreed. Having had a child go through a rezoning, she said it wasn’t easy on her family or her kid. From a different perspective, District 11 candidate Stuart Cooper said both he and his wife attended big high schools. He expressed the thought that larger schools didn’t bother him. Although, his opponent, KC Haugh, said he wasn’t sure that was the best approach for the whole county and felt more comfortable with a middle-of-the-spectrum approach. School sizes in the system vary, with Ravenwood as the largest and Renaissance and Fairview as the smallest. Several district candidates found school growth as a whole looming as the biggest challenge ahead of them if elected to the board in August. His opponent, Denise Boothby, said she agreed but was more concerned with growth in terms of what it meant for classroom sizes and how it relates to the individual student. District Five candidate Gary Anderson said he understood growth would prove as the largest question to tackle. He and his opposition, Julie Mauck, live in a district that will have both Mill Creek elementary and middle schools and Nolensville High School open up in July. This is part one in a series of three about issues and stances shared at the Home Page candidate forum.